Donate and support El Enemigo Común! Please enter a donation amount, your name, and email address. You will be taken to PayPal to donate securely. El Enemigo Común is an entirely free, all-volunteer operation. To ensure we continue to be so, please give what you can to help cover our operating expenses. In February 2018, elenemigocomun.net celebrates its 13 year anniversary. For 13 years we have been churning out independent media from Mexico in English and Spanish. For 13 years our independent journalists have published investigative articles and our translators have translated independent media that both continue to be relevant today. For 12 of those 13 years elenemgocomun.net did not ask our readers for any direct monetary support. 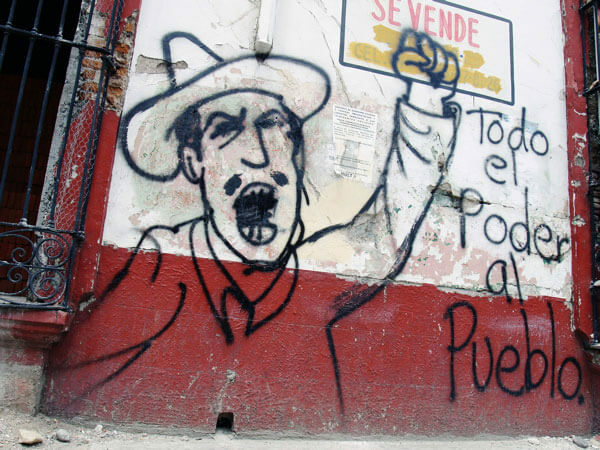 All we asked was that you read us, reference us, repost us, and use our work to call out and counter the often-disgraceful corporate journalism about Mexico and the Mexican people. As a project we have prided ourselves in providing this type of journalism and resources to our readers for free for those 12 years. We want the project to continue to be relevant and current, and in order to do that we feel the time has come to ask our readers for a little bit of financial support. Over the course of these 13 years, we have improved our online presence, including developing a robust, customized website allowing us to provide the bilingual journalism you know us for. This presence costs most. It is not a lot, but for an all-volunteer operation, it is substantial. Our original goal in 2016 was to raise $650 to cover our expenses for the following 2 two years. We were almost able to raise that total amount, which covered us for the last 2 years. We are not undertaking an elaborate fundraising campaign but we do have the ongoing internet hosting expenses associated with maintaining this site. We are simply asking for you to give what you can to keep us paid up for the next two years. That’s it. We are proud of our efforts to bring greater attention to the brave and diverse resistances that have taken place over the past 13 years in Mexico, and will continue to be able to do so with your support. If you can’t or do not want to donate anything, then you don’t have to.. But if you can pitch in, please do so according to your means. Towards the next 13 years of the struggle!